“Water” is this week’s Diva challenge. I love water. It balances me. When I was suffering from horrible migraines, besides the dark room, pillow over my head, ice pack over my eyes, and drugs, the sound of waves was what helped me to try to relax. It was imagining myself at the beach with the wind blowing and the rhythmic sound of the waves that got me through it. Sometimes I still have to imagine that just to get to sleep at night. 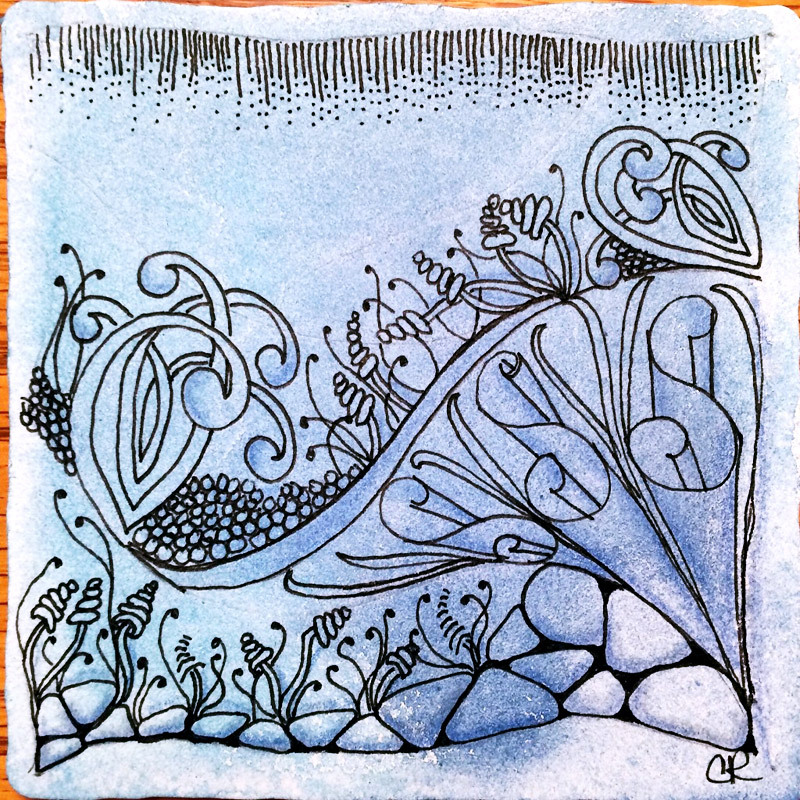 I used a regular Zentangle tile for this challenge. I spritzed it with 2 Shimmer paints, Mama Sings the Blues and Jeni B Blue. Instead of using regular graphite pencil, I used my lovely Fantasia Colored Pencils. They are so pretty and smooth. Did I mention that I love color? Don’t get me wrong, I love the simplicity of black and white too, but color… It makes me happy. Along the lines of water, my daughter picked the theme of “Under the Sea” for her son’s baby shower, nursery etc. It fit well since she thought she was the little mermaid when she was young. She insisted that her (black) hair was a lovely shade of red. 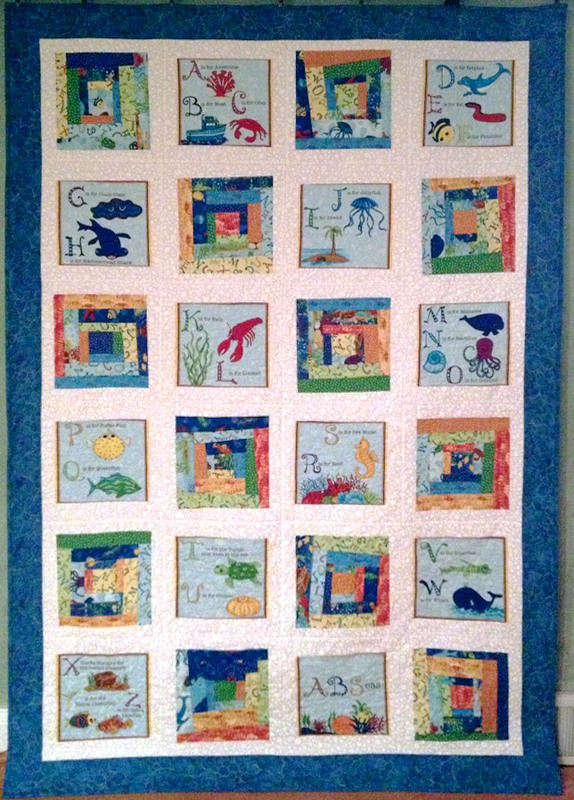 The quilt below was the one I made for her son (now 14 months old) with fabric called “A B Seas” and oh-so-cute! It is kind of hard to see the details in this picture but all of the ABCs have under the sea related words associated with them. You can get an idea what they look like if you click on the “A B Seas” here or above. Also the quilting, which I did on my regular sewing machine, was done with a lot of circles, swirls and shell looking designs. I admit, I had a lot of fun doing it even though it took a long time, it was truly a labor of love for my cute little grandson. Lovely, your tangle choices are great, especially Zenplosion Folds 🙂 Water seems to be in your future, Ethan’s quilt is wonderful. What a great gift. A lovely soft tile, and I like the movement. 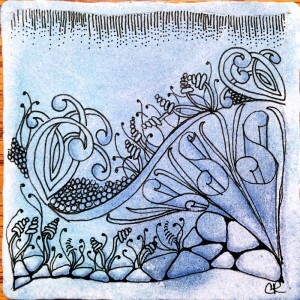 love the blues and the sea feel of your tile. 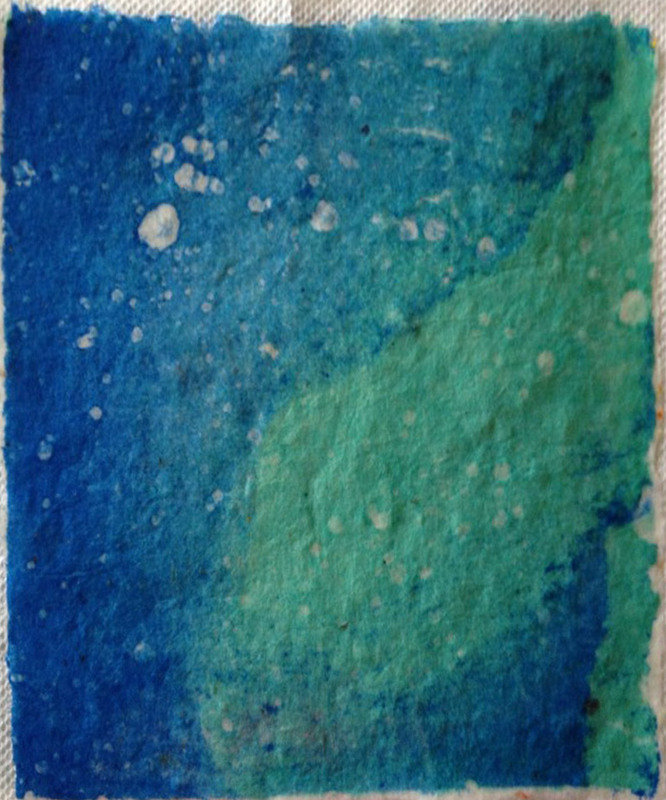 The paper is beautiful (I feel the same way about colour). The quilt is truly awesome. Well done all. Very lovely tile! Like your choice of tangles and the soft blue background! It’s a great tile! Love that soft blue background color! Beautiful tile on lovely Blue colours! Love this tile, love the background. Isn’t it fun to create this colored tiles? Nice flow of tangles. Looks peaceful.